i always say "i'm not a quilter" as sort of a way to defend my stuffing dolls with fabric scraps (rather than stitching the pieces together into a quilt). but in truth i'm starting to think of myself as a "quilter of words" . each of you who contributes to the newsletter is sending me a "piece". i group them to make "blocks". and the final result, the newsletter itself, is the "quilt". once it's all "sewn" together through the editing process, we all get to enjoy the warmth that radiates from sharing. a quick note to clarify that the primitive pals isn't exclusive to doll makers. we like all sorts of primitive stuff: wood, quilts, stitcheries, drawings, any ole thing that would be considered primitive. saundra: "On November 14th Lisa was the guest of honor at the Crooked Tree Hollow Doll Club meeting which was held at Frannie Meshorer's home. Lisa brought a variety of fantastic dolls which were offered for sale and was quite generous to donate a wonderful Snow Angel to be auctioned off to help the club fly Sonja Sandell (Hickety Pickety), from Kansas, to visit us in January 1998 from Kansas. Since Lisa was teaching a primitive doll making class the next day, Lisa, and her daughter were also Frannie's house guests for the night. The primitive doll class began at 10 a.m. on Saturday, the body parts of the doll to be made at the class were pre-marked on muslin, it was easy for everyone to get started with sewing and stuffing. There were several choices for stuffing and many chose to use sawdust, to replicate that which was used by our foremothers. I decided to use torn rags to stuff my doll, but there was also 100% cotton batting and the Fiberfil that we are most familiar with. Lisa shared some of her wonderful techniques for aging dolls. To age the doll body she applies a certain color acrylic paint and antiquing medium (the colors depend on whether you are making a primitive black or white doll), then allowing the paint to dry. Once dry, the doll is then sanded to soften the fabric and to give it a worn and loved appearance. While the dolls were drying, we each did our own thing to clothe our individual babies. Although everyone brought some fabric to be used in the making of doll clothes, there was old feed sack material, antique clothing and other items offered for sale in order for everyone to get "just that perfect vintage look". Some chose to have their doll barefooted and others to wear tea stained socks and worn shoes. In addition to the traditional tea or coffee staining of clothing, another technique we learned from Lisa was to use a little of a brownish floral spray to get streaks or overall coverage. This was a great technique to learn and it certainly achieved the appearance I was looking for with my doll, good ventilation is very important with this procedure. Of all the doll classes I have participated in, this one was by far the most relaxing and most fun. Don't get me wrong, I have loved every class and every doll artist from whom I have taken classes. Generally with contemporary dolls I tend to put too much pressure on myself to have perfect results. On the other hand, the primitive doll class of Lisa's was different. Even when the neck of my doll ripped a little while stuffing I did not freak out and get tense - I just did a simple sewing patch job, which only added more charm to her. Besides, I'm sure there was many a mom in a covered wagon who did similar doll surgery for their daughters. I love the doll made during the seminar given by Lisa and have since made a black doll (using Lisa's techniques) as a companion to her. They both sit in my kitchen watching my activities and smelling what is being cooked or baked. But, wouldn't you know, those darn girls don't lift a finger to help. " "The primitive class with Lisa Gaines was a treat, as was meeting Lisa and her dolls. Her dolls are wonderful but difficult to describe. Very primitive and worn looking. 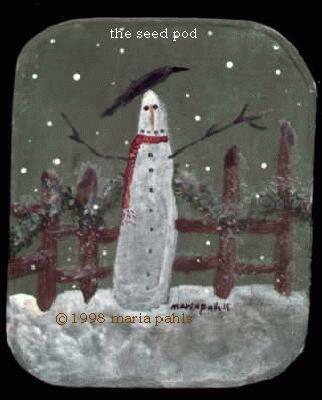 She uses a mixture of dark acrylic paint and acrylic stain(folk art brand I think) to paint the doll's face and body. Idea is to barely mix the paint mixture so it will streak when you paint the doll. The streaks of stain make it look old. After the doll has dried the surface is lightly sanded with sandpaper. You can then paint or embroider the face any way you want. The dolls we made in class were about 11" to 2 feet tall depending on how long each person choose to make the legs. Lisa gave us a doll body pattern. 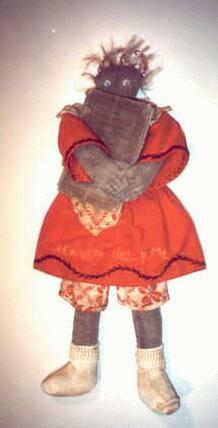 The dolls were stuffed with a variety of materials, sawdust or cotton batting. I used sheep wool and Saundra used old rags and fabric scraps. Her doll was very heavy-really neat. The faces were either primitive with eyes under the lid line, or primitive raggedy ann style. Saundra and I did the raggedy ann type. She painted hers and I did some painting and some embroidery. Dressing the doll was really fun as Lisa didn't give us a clothing pattern. Each doll came out different. I love my doll but she is so primitive my family doesn't understand her- but that's okay. Some of us used old baby shoes. Lisa brought red dyed yarn and flax to use for hair. Cindy made an angel doll and put her in a white baby dress. Lisa's dolls were a treat. She brought several large dolls to the Crooked Tree doll club meeting. They were about 21/2-3 feet tall. Primitive Beauties! Lisa uses old wooden chair legs for doll legs, and for one doll she used the curved top back of a chair for angel wings. A 4th of July angel had corrugated roofing for wings. Instead of hair Lisa cut several stars from metal and attached them to the dolls head with wire. Her prices were very reasonable. One angel doll had a beautiful verse on her apron. The doll was barefoot and the verse said something about trading her shoes for wings because she wouldn't need shoes in heaven." "Lisa Gaines' class was the most relaxed class I've ever taken! The doll I ended up with is stuffed with sawdust (lots of fun, and I love the feel of the doll). We painted the body with a blend of paints and sanded it after it dried so it looks and feels like old leather. My friend Cyndi gave me a piece of red wool for her dress, and a crocheted doily for her collar, AND some flax for her hair, AND an old pipe cleaner Christmas decoration for a halo. I attempted a painted face with a long sculpted nose. I wasn't able to do a mouth I would be happy with, and her eyes are sorta googly. Her hair is wild, and her eyes look up to the ceiling. I embroidered "HEAVEN HELP ME" on the dress (yet another suggestion from Cyndi - I think I should probably just give her credit for the whole thing!!!!). I wasn't quite happy with her until really funny thing happened. I went to an antique show, and I was looking at some old 1915 elementary school books. I bought three, thinking they were old readers. When I got them home, one was an arithmetic book. I had terrible math anxiety in elementary school. I put the book in the doll's arms, and now she peers frightfully over top of this book, and the saying says it all." sonja: "Opinion on Jan. thru March stuff....definitely think that if doin' finished stuff for shows that gals should always have just a few seasonal things on hand, whether it be Xmas or Halloween, Easter, etc....many customers know that they might never see your stuff again especially if ya are doin' a show out of your own area.....don't want to spend alot of time on out-of-season stuff...but hey if ya got it left over from before, why not take it? Thanks again Maria....I don't know if the others realize what a privilege it is to be on your list to receive your newsletter.....you really open the doors to so many of us to get to say what we want and help us to find other avenues for our products, etc...... Thank You!" toni: "I take my dolls outside and hang them on a tree and take a picture. I also take them to Office Depot and make a decent photocopy of the doll - actual size - for my records. (I get some funny looks from people when I do this!) If I don't have film, I will occasionally have a color photocopy made of the doll before I mail it. I try to remember to take a white pillowcase to put behind the doll when photocopying." I came across directions for staining fabric for a cross-stitch sampler. The pattern was from the company The Goode Housewife owned by Anne Brown. I spoke with Anne and she gave me permission to pass this recipe on. I haven't tried it yet but plan to soon. Shave off about one teaspoon of black walnut hull and put in a small old saucepan with about a cup of water. Bring to a boil, then simmer until you get the color you want. Anne says she then dabs the stain onto the sampler with a paper towel, spritzes with water and irons to set the stain. The hull is the soft green covering over the walnut shell when they come off the tree. You would shave the dark inside part of the green material. My husband has used walnut hulls for years to make a natural stain when restoring old furniture. Anne Brown has a nice line of small original and historical samplers. She has three Adam and Eve designs as well as others. I plan to do one next year as a wedding sampler. Note: Lisa was interviewed in Seed Pod issue 51. The Country House "The Largest Country Store in the East" providing antique reproductions, colonial style home accessories and primitive country designs. lives in eternity's sun rise"